By William Breathes on June 24, 2013 News, Say what? Dr. Donald P. Tashkin isn’t a household name, even for cannabis smokers. But he should be. TAshkin’s studies on cannabis use have shown time and time again that cannabis use is not associated with increased lung cancer incidences or risk. Tashkin’s work is the focus of an article in this month’s Annals of the American Thoracic Society, highlighting the doctor’s work with the David Geffen School of Medicine at the University of California, Los Angeles. While smoking cannabis does cause minor injury to the large airways, the damage is microscopic and similar to that of chronic bronchitis. Like chronic bronchitis, the damage goes away once the irritation is gone. In short: if you stop smoking ganja, your lungs will heal. In summary, Tashkin found no link between marijuana use and chronic obstructive pulmonary disease or lower respiratory tract infections. Most importantly, he found that there isn’t a link between puffing spliffs and lung cancer. 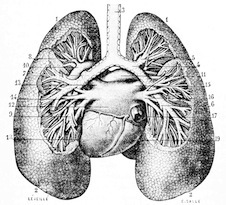 This is the second lung cancer-related study to come out in as many months. Back in May, we told you about a report in the American Association of Cancer Research that compared occasional marijuana users to heavy marijuana users and tobacco users. The results? Marijuana users don’t have an increased risk compared to both tobacco smokers (duh) and to non-smokers.